Battle Brothers, from Overhype Studios, is a game which, upon playing for the first time, my immediate reaction was to wonder how in the world no one had made a game quite like this before. It can somewhat be described as a mash-up of concepts from games like Mount and Blade, Darkest Dungeon, X-COM, and Final Fantasy Tactics. If that gets your attention, by all means go buy the game right now, because you will love it. Come back and read this while it downloads. The game puts you in command of what's left of a company of mercenaries, immediately following the death of your captain and most of your fellow mercenaries in an ambush. You start off with three decently equipped soldiers and a limited supply of funds. You then set out to make your way in a randomly generated world full of opportunities. Movement on the campaign map is very much like that of Mount and Blade, with your company represented by an icon traveling the world and encountering other groups of people, be they trade caravans, peasants, or bandits. Combat takes place in turn-based battles on a hex-based grid. I'll save a more detailed description of the gameplay for my review when the game is closer to release (there is one last big patch coming before then). Today I simply wish the regale you with the tale of my first campaign. 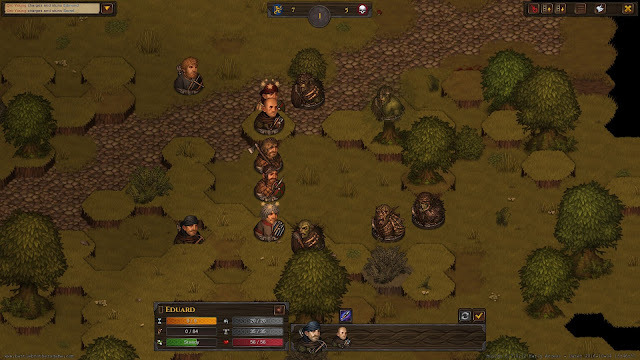 Battle Brothers uses the "Busts of soldiers bumping into each other" art style. Which works nicely here. Following the previously mentioned ambush and near annihilation of the Battle Brothers mercenary company, the survivors resolved to rebuild and hunt down the murderous bandits. Unfortunately, the only volunteers willing to join our force were a couple of bored villagers, the town drunk, and a vagrant or two. Fortunately, these men came cheap, leaving me with enough money to buy them some gear. Even a stone-cold mercenary captain can't send men into battle wearing tattered rags and wielding wooden sticks. He can't have his investments *ahem* loyal soldiers cut down in a single blow. We had to travel to a larger village down the road to find better weapons for the men. This gave me time to get to know them better. Each man had a story to tell. Some were simply bored with the life of a peasant, feeling they were destined to travel the world and do something greater. Others were down on their luck after repeated misfortunes, and saw joining a company of mercenaries as a chance to climb out of the gutter. I sympathized with their tales, but, honestly, I needed warm bodies to fill the ranks and they were the best I could afford. What happens when you bump into an orc raiding party before you are ready. After assembling all the men and equipment I could afford with my starting funds, I returned to our previous employer who sent the company after those bandits in the first place. He would pay good money to have the bandit leader killed once and for all, and knew where the scumbag was hiding. My rag-tag band tracked the bandits to their camp and moved in for battle. The ensuing chaos was almost too much for my untrained soldiers, but with superior numbers we were able to overwhelm the bandits and take out the leader. Sadly, he was able to cut down one of the original members of the company in the melee. Another man, the beggar from the village, was wounded so badly that he would never be the same with a sword or spear, but I still needed him in my fighting line until I could hire a replacement. Regardless, victory was ours, as well as the loot and payment that came with it. With these new funds I was able to hire and equip a couple of new men. I also treated the company to a round of drinks at the tavern to lift their spirits. We were still a pitiful looking rabble, but we were able to find work escorting a convoy on a journey that would take a few days. I negotiated with the caravan master for some funds up front, and used that restock our food and medicine supplies. Along the way we were attacked by some roaming highway men, but came out victorious once again, though battered and bloodied by the fighting. After reaching our destination and getting paid, I decided to let the men rest for a couple of days. I also picked up a few more pieces of gear, including some real armor. Well, leather armor. Chainmail and plate was far beyond our current budget. 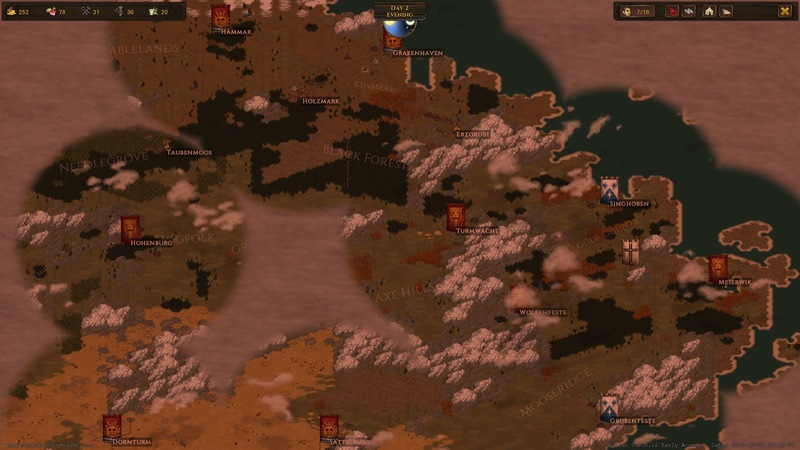 The world map of Battle Brothers will be familiar to anyone who has played Mount and Blade. Once everyone was healed up, we took another contract escorting a caravan back towards where we started out. This time there were no bandits. We were still paid in full, despite only marching for a few days. Now that's my kind of work. This pattern continued for a couple of weeks. Escorting caravans and tracking down thieves. Despite humble beginnings, my company was starting to come together. Most of the soldiers now had real weapons and armor, and some were becoming much more proficient at combat. I had also lost a couple of soldiers here and there, but each town along the road had its share of desperate men looking to join for one reason or another. Overall, things were looking good. My over-confidence would be my downfall. Having gained a small reputation, we were offered a lucrative contract by a local lord. He wished us to go on a lengthy patrol of the roads to several nearby towns. We would be paid a moderate amount for this, but, more importantly, would also be paid a bonus for each bandit head taken along the way. The men buzzed at the thought of slaying every bandit we could find along the roads. The first leg of the patrol was uneventful. Not a bandit in sight. Myself and the men were disappointed. Our payday would hardly cover our travel expenses if the rest of the patrol went like this. Little did we know we were about to walk into the hornet's nest. Our maps showed most of the surrounding area, but one uncharted region lay between us and our next destination. No matter, we were a company of killers at this point, and no bandit mob would be able to take us. Venturing into the unknown, we finally stumbled across some bandits. It was a small group, no match for the dozen men now under my command. We struck them down and moved on, looking for more victims. Another group appeared, slightly larger than the last. We fought a good fight and wiped them out, suffering only a few injuries. The men were giddy at the thought of the ever growing payment we would receive in a few days. Yet another group of bandits appeared, just a handful, and we swooped in. To our shock, these bandits were not the usual mangy lot, they were real fighters and carried real weapons. This proved a tough fight, despite our 2:1 advantage in numbers. A couple of my men fell in the fighting, and more were wounded. We survived though, and could carry on. A little further and we would be out of this wild area. Then we saw it. An abandoned fortress turned into a bandit stronghold. That must have been where all the bandits were coming from. The lord who hired us would want to know about this. Just before we cleared the uncharted area and made it to safety, another bandit party found us. This one was almost as large as our force, and was as well equipped as the last group we fought. We had to run, contract or not. Unfortunately, we could not run fast enough. The group caught us and surrounded my company in a forest. Attacked from all sides and hemmed in by trees, the men were unable to support one another. They fought valiantly, but were cut down one by one. In the end, every man on each side was dead or dying, save two. The last surviving member of my original company was still standing, a crossbowman who had saved the day more than once. With his last crossbow bolt he had cut down an axe-wielding bandit, but his luck ran out as another bandit rushed forward through the mangled corpses. My soldier pulled out his knife, all he had left to fight with, and stabbed uselessly at his well armored foe. Seconds later he was slain. My mercenary company was completely wiped out, just like that. Battle Brothers promises to be one of the best strategy games coming out this year. 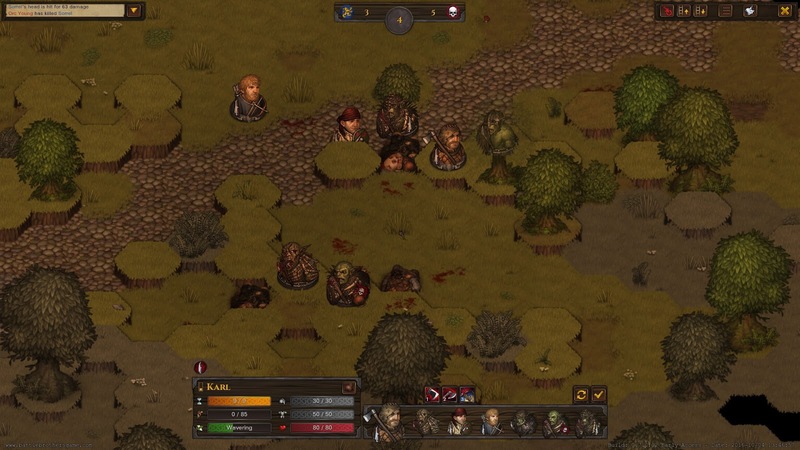 It's got a bit of RPG, a bit of team management, and lot of tactical combat. The full game promises to have world shaping events and quests for your mercenary company to participate in, but the game is already a massive success in my eyes simply based on the core mechanics. It very much captures that feeling of freedom and choice that you get in Mount and Blade. Traveling around from village to village, recruiting men, buying equipment and supplies, ultimately creating a deadly fighting force. Except here it's done even better. Every soldier has a back story and individual stats, as well as special traits. Almost everything in the game uses procedural generation, but it doesn't feel like it. I did not know very much about this game going in, having simply not seen it mentioned anywhere. However, I was completely blown away by my initial experiences. The game is still in early access, but is completely playable and feels very polished. Once it comes out the price will go up, so if you think you would like it at all I seriously recommend picking it up now. Look for my full review in the next few weeks!